Five Year Investigation by Sheriff Finds Obama’s Birth Certificate is a “Fake”! 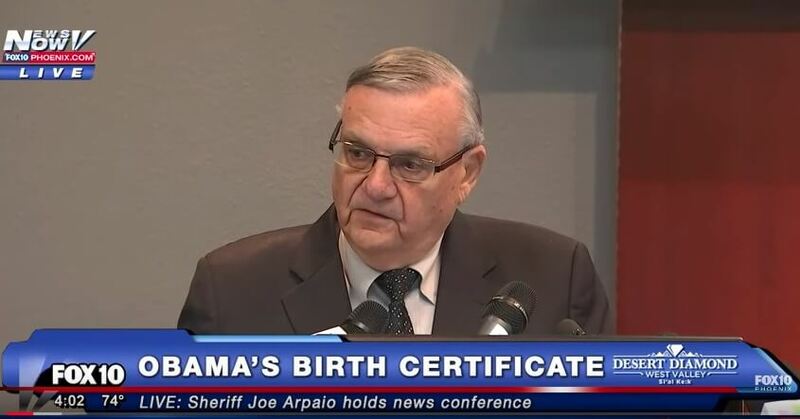 On Thursday, as announced, Maripoca County Arizona Sheriff Joe Apaio held a press conference to settle, once and for all, the legitimacy of the birth certificate Obama produced to prove he was born in the U.S. Known as America’s toughest law-enforcement sheriff, he declared he would prove that the certificate in question was a phony….and….he did!! This has been an exasperating and contentious issue even before Obama was shoe-horned into the Oval Office. All of his identification papers including his birth certificate, college records, marriage certificate, family records were SEALED. Those records became a “no go zone,” in true Muslim fashion. The Obama apparatus spent millions of dollars on high-powered lawyers to block any and all information about him from being seen or released, which made no sense. Muslims who come across our borders are vetted in case they are jihadists intent on attacking our country from within. But the man who would be put in the office of President of The United States was NOT and has not been vetted and anyone who questioned this was vilified by the Soros controlled media, like they have done with Sheriff Apaio and others. Obama’s citizenship and birth details raised suspicions immediately. One must be a natural born citizen to run for the office of President of The United States. Born under the name, Barry Soetoro and raised as a Muslim, he was required to adopt a Muslim name, which was and is, Barack Hussein Obama. Not much was known about Obama except that he had a history of homosexuality. His handler George Soros invented him, had him schooled by Communists and managed to get him into U.S. political leadership as a Senator from Illinois. This prompted the Kenya newspapers to brag: “A fellow Kenyon, born here, one of us...is now a United States Senator!” That says it all. This writer logged onto the Kenya newspaper’s website to see this. In their zeal about ‘one of us,’ they joyfully included that very birth certificate showing him born in Kenya which we saw. After he was manipulated into the Oval Office, his birth certificate was scrubbed from that site. What is more, they were hostile to any inquirers who came to the country to obtain information, including Jerome Corsi of World Net Daily. Now that ‘one of their own’ was named President of The United States, Kenya wanted to hang on to that distinction and put roadblocks in front of anyone seeking the truth. We do not know all the details about Michelle, their marriage, or their children. First of all, when this is examined, there must be DNA samples from both Obama, Michelle and their two children. That will provide some extraordinary revelations. Soros, the billionaire Hungarian Jew, who sold out his own people during the holocaust, came to America, became a citizen where he is able to work from the inside to transform our country into a 3rd world Communist controlled country. Obama was his man to destroy America, the only country standing in the way of the New World Order. And why? Because the majority of Americans are Christians, churches dot the landscape, and it is not possible to enslave the mind of a devoted Christian. These events, they say, are fueled by racism, not by any black committing a violent crime or posing a danger to law enforcement. This was part of the agitation leading to the race wars which are now building under the Soros title, Blacks murdering whites, or other blacks, was not and is not an issue, and totally ignored by the press. Those who voted for Obama, and they were few, were boosted by the proportion of illegal votes, multiple votes and the incredible number of dead people listed as having voted. Whites were basically ‘shamed’ into voting for him. Soros had to give the impression that Obama was indeed, voted in by the people. No hanky-panky involved doncha know. And anyone who questioned Obama’s legitimacy, or any insane ruling he made including opening our borders to those who would destroy us from within, was pegged, ‘RACIST.’ Any criticism was and is based on….yes that useful word again….racism. After pressure mounted, Obama finally produced a Hawaiian birth certificate. This columnist saw it and knew it was a fake. First of all, in the box, “Race” he was listed as–now get this–African American. How’s that again? In the 1960’s that term was not used. The term then was, ‘Negroe.” We got on the horn and let that be known. Then he produced another Hawaiian birth certificate. In this one the “Race” box had been taken out altogether. And it is to be noted that the woman in Hawaii who was in charge of records, and had the truth in front of her, was “whacked,” a CIA term meaning killed in a plane crash. Many of those have happened over the years, particularly during the Clinton administration. Sheriff Joe Arpaio has been unmercifully hassled, slandered, libeled, and his very position as sheriff was jeopardized. Soros was able to recruit the number of useful idiots to try with all their might to bring him down. His news conference, which was live streamed, shows vividly that the birth certificate Obama presented was indeed a fraudulent document and experts showed exactly how that certificate was created. What an eyeopener! This means an investigation must follow and charges be filed immediately against the most incredible hoax ever pulled in history along with the man who fraudulently posed as ‘president.’ Plus, that provocateur who put him into the Oval Office, George Soros, MUST be charged and prosecuted for treason and sedition.